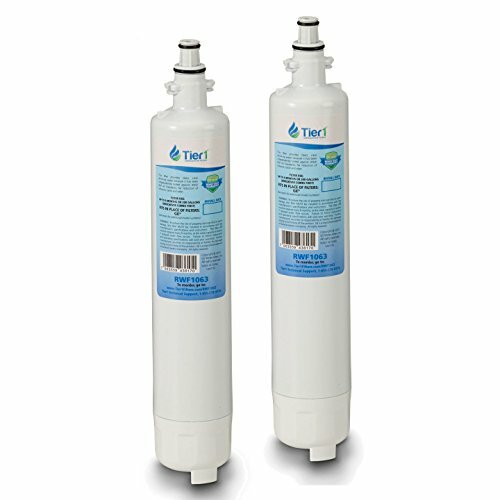 Engineered to fit the same refrigerator models as the GE RPWF, the RWF1063 Tier1 (2-Pack) replacement refrigerator water filter reduces many commonly found impurities from your drinking water. For up to six months after installation, the RWF1063 reduces chlorine taste and odor, dirt, sediment, turbidity and more! The RWF1063 is an ideal solution to your filtration needs, ensuring you serve only the crispest and cleanest tasting drinking water! Order today! DESIGNED TO FIT: Refrigerator models that require the GE RPWF, NOT with a chip recognition and will nto work with refrigerators needing RPWFE. NSF 42 CERTIFIED: Each Tier1 refrigerator filter is tested and certified for materials and structural integrity requirements. HIGH EFFICIENCY FILTRATION: Reduces Chlorine Taste & Odor, Rust and Corrosion, Sand Sediment, Silt, and Turbidity for 300 gallons or 6 months, depending on water usage and quality. REPLACEMENT MODEL: This is a replacement comparable part to GE RPWF & WaterSentinel WSG-4, PYE23KSD, GNE26GSD, GFE29HSD, and PWE23KSD.